Spa Aluminium manufacture Vandgard Anti Climb Products at their works in Tunbridge Wells. Fully automated Cross Cut Saw for close tolerance cutting (+/- 0.5mm) Double Mitre Saw for accurately mitreing sections to make-up frames etc. 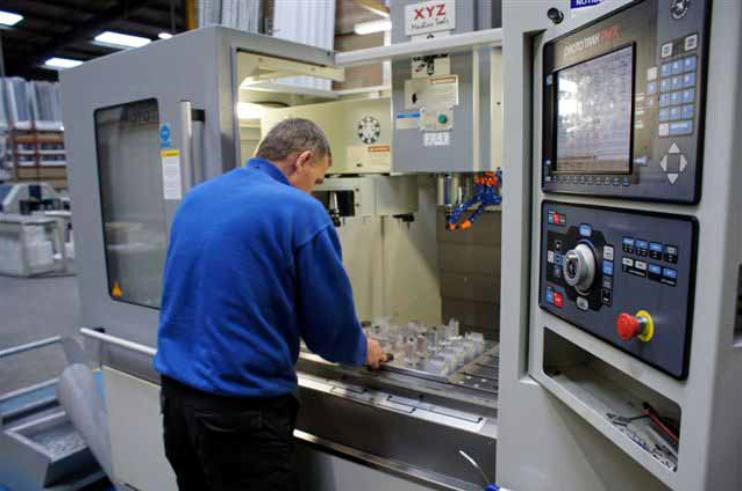 A variety of equipment for long and short production runs of drilled components. Single & Double headed Machine Routers for the production of those special shaped holes. 7 Tonne Air Press with Auto-Feeder for punching holes at pre-determined centres along the length of light aluminium extrusions. Ideal for large quantities of ongoing production runs. Plastic Coating Machinery for the protection of sheet products. Automatic Wrapping Machines for the protection of finished extrusions. Other processes available through sub-contractors, forming of sheet, welding, milling, stamping, bending etc. Guillotine for shearing aluminium sheets up to 10' (3048mm) in length and 1/4" (6.35mm) thick. Your enquiries are welcome for all types of Aluminium Fabrication.